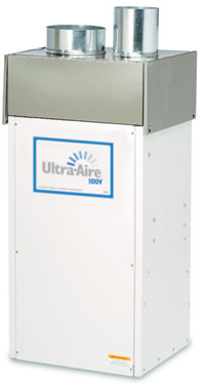 The Ultra Aire 100V is very similar to other Ultra Aire units but is configured for mounting in an upright position where this is most convenient. It is a powerful unit with a water extraction rate of 100 pints per day and is rated by the manufacturer as suitable for a home with a total floor area of up to 2,500 sq ft. The Ultra Aire 100V is a highly energy efficient whole house dehumidifier with an energy factor of 2.9 litres of water per kilowatt hour. This is more than 50% better than any room dehumidifier and fully justifies its Energy Star qualification. Like other Therma-Stor whole house dehumidifiers this is achieved by utilizing refrigeration to cool the incoming air stream below its dew point. This cooled and drier air is used to pre-cool the incoming air stream resulting in a significant increase in overall efficiency. Where this unit differs from other models in the range is in its shape. Whereas the other three are low in height for placement in a crawl space the 100V is taller to allow a smaller "footprint" making it particularly suitable for a basement with restricted floor space. Although 42" high the dimensions of its base are only 21" by 17", just under 2 1/2 sq ft in total. Wherever it is located the Ultra Aire 100V can reach every room in the house by being attached to existing ducting for the heating/cooling system or with self contained ducting. If the basement is your preferred location the V100 is well adapted to this environment. Basements are usually cooler than the rest of the house and this can be a problem for dehumidifiers which, because they use refrigeration coils to condense water vapour from the air, can be disabled for long periods when ice forms on the coils, even at room temperatures as high as 65°F. The V100 is capable of low temperature operation and will operate very effectively at temperatures down to 56°F. Excessive humidity is a factor in air quality but there are others. The Ultra Aire 100V is equipped with a MERV 11 filter as standard which will remove most air particles, including many mold spores. Good though this is it can be upgraded by installing a MERV 14 filter in addition, capturing many more smaller particles and operating alongside the MERV 11 which acts as a pre-filter. Crucial to the V100's performance is a humidistat which regulates relative humidity according to the programmed setting. The dehumidifier will only operate if the level of moisture rises above the chosen level and will cycle off again when it returns to that level. Because this prevents the unit from operating continuously it saves on energy and keeps relative humidity constant within a range of a few percentage points. This is beneficial for the occupants of your home and can also be important for any moisture sensitive item such as a piano. The dehumidifier is also equipped for continuous drainage which allows the condensate to be discharged to a nearby drain or other outlet by means of a plastic hose. If the nearest outlet is at a level higher than the unit's location a condensate pump is available to force the water up to the next floor of the house. Like all good quality whole house dehumidifiers the initial outlay for this unit is relatively high. This initial cost has to be considered against the expected life time of the unit, which comes with a five year warranty, the lower energy costs and the purchase cost of room dehumidifiers, of which more than one would be needed to achieve comparable results.